Tank setup: A large and fairly deep tank, with subdued lighting and gentle circulation. 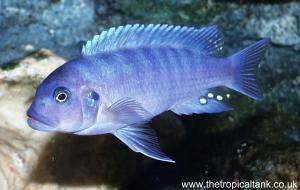 Compatibility: Generally peaceful, keep in a species tank or with other peaceful fishes with similar requirements. Water chemistry: Soft and acidic, pH 6.0-6.5 is preferable, and required for breeding. However, contrary to many "Discus Myths", they can thrive in harder or more alkaline water. Feeding: Omnivorous: live and frozen foods, flake and granular foods. Sexing: The only definitive means of sexing is the genital papilla, which is pointed in males and rounded in females. 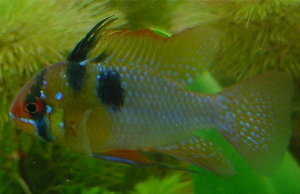 Breeding: Eggs are laid on a pre-cleaned spawning site and both they and the fry are protected by the parents. The fry initially feed on a body mucus secreted by the parents. Comments: The discus is sometimes known as the "King of the Aquarium" by enthusiasts. While discus seem to have many "myths" about their requirements, it is true to say that efficient filtration and attention to water quality are essential to maintain discus in good condition. They are best kept in a group of around 6-8 individuals, within which a heirarchy will develop. They should not be included in general mixed community tanks - rather selected companions can be chosen to compliment the discus. 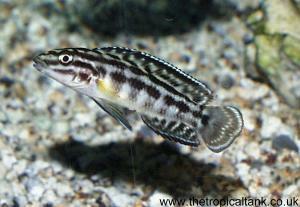 Popular choices include Corydoras catfish, dwarf cichlids and peaceful medium-sized tetras. 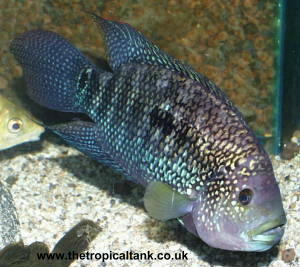 Symphysodon aequifasciatus, the Green Discus. Symphysodon haraldi, the Blue or Brown Discus. 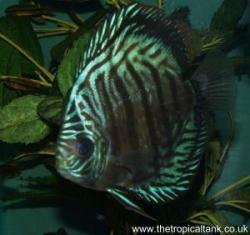 The wild-type Discus have been cultivated into numerous colour varieties by breeders.